PSV is the major football club in Eindhoven, playing in the Dutch Premier League. The other professional football club is FC Eindhoven, which plays in the second league. PSV stands for Philips Sport Vereniging, which means Philips Sports Union. The club was originally founded by Philips in 1913 as a team for their workers. PSV is generally considered one of the top 3 teams in the Netherlands and the club has won the national championship 21 times; only Ajax has beaten this number with 29 titles. PSV won the European Cup (the current Champions League) in 1988. PSV has been a home to various talented players who have spread over Europe and the world afterwards. Who doesn't remember the likes of Ruud Gullit, Romario, Ronaldo, Ruud van Nistelrooy, Jaap Stam and Arjen Robben? They've all played at PSV. PSV plays its home games in the Philips Stadium, right in the city centre. The stadium is build on the original grounds of the very first sports grounds of PSV. 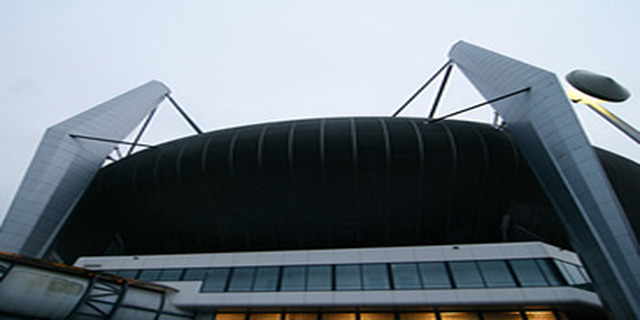 It has been expanded a couple of times and can now host 35,000 people. It is possible to book a tour through the stadium. Also, the fan shop is worth a visit. interesting info about the original reason for the establishment of the club. Very interesting reading now I know what PSV stands for.